When we first visited Sri Lanka, in January 2005 just after the tsunami, Carsten Henningsen carried hand drawn artwork created by Janet Reynoldson’s second and third graders. We had been strangers, but soon the artwork and letters were traveling back and forth between Portland and Eastern Sri Lanka and it wasn’t long before we considered each other friends. Here is one such friend, Ruwanthi, holding up a letter from the States. “Dear Miss Ruwanthi Kalpana and friends. I am feeling sad because I read your letters and my eyes filled up with tears. I am very sorry for your losses. All of my hopes go to you. Maybe we could be pen pals. Do you know what that is? It’s when you only keep in contact by writing. That’s the “pen” part. I am very happy you survived and your sisters too. Did it hurt when you got tangled in the tree? What grade are you in? My dad is a friend of Carsten. I absolutely love the drawings you guys sent to us. How old are you? Because we probably won’t meet this is what I look like. I have short brown hair, brown eyes, dark pink lips and long eye lashes. What do you look like? What happened to your sisters? I am 9 years old, 10 next February. I will always help you in your troubles. During her eighth grade year at the Arbor School in Portland, Rebecca and all her classmates worked on yearlong study projects of their own choosing. Rebecca decided to do a photo essay on the topic of displacement in Sri Lanka and its impact on children. With the war in the area around Ulla over, it suddenly became possible for our whole family to travel somewhat freely together. So, we made plans to travel to Ulla and, it being so close to Christmas 2009, this happened to put us in Ulla for the fifth year anniversary of the tsunami. Ruwanthi and her sister had both stayed close to Community Friends, since they had asked to join the first micro-enterprise that we formed in Ulla. This was the rice flour collective. Of course the war made it very difficult for us to communicate with Ulla between 2007 and 2009, so when we arrived for the family visit not much was known. That first day in Ulla was exciting for all of us. I set out to look in on the collectives with Deva and Seevali, while Rebecca journeyed out with her sister Raela and mother Kathleen. These were her first moments shooting pictures around the community. After hearing the initial reports from the collectives, the three of us asked about some of the young entrepreneurs, so we could get some first hand accounts of how the program was working. One of the school kids volunteered to walk us around the village and show us where each person lived. As fate would have it, the first house that we visited was Ruwanthi’s. And who should we meet there but Rebecca, Raela and Kathleen! The two of them had found each other on their own and within a few short minutes made all the connections back to 2005. Ruwanthi was able to find Rebecca’s original letter which she showed to my amazed daughter. Somehow, the dream we had when we conceived of Community Friends, that we would build long term, direct relationships, with people whose names we know and vice versa, was suddenly realized before our eyes. Thank you Rebecca and Ruwanthi – we are so proud of both of you! Summer Jobs for Students in the U.S.
Community Friends is offering students an opportunity to earn some extra money this summer by helping us sell carbon offsets. Mona Das is a student at the Bainbridge Graduate Institute in Washington State. She is leading the effort to support our summer student program. Community Friends started the health clinic in 2007. We have been able to establish regular care for hundreds of villagers who are geographically challenged to health care access due to the remote rural location of the tea plantation village. Our resources are limited and we have been able to operate one clinic day each month. The demand is obviously much greater. The good news is that one of the neighboring tea plantations is now helping with the clinic by supplying a full-time nurse practitioner as well as a nurse midwife who visits during the month. This is a wonderful step up in the quality of life for the village. And it is also consistent with the philosophy of Community Friends to seed a project and get it started with the hope that the project will transition into local support. We used the same process with our school lunch program. That program is now administered by the local government. By seeding projects that the community has identified and communicated to us as key areas for assistance, we are able to establish a successful working pilot model. Once the pilot has proven success, it is easy to transition the program to local support. This frees up Community Friends’ resources to then begin seeding a new pilot project. This process is at the core of the Community Friends philosophy. It is also a way for Community Friends to create long-term relationships of trust in the community. We always work from the bottom up in collaboration with the communities we serve. We prefer to operate our programs on a human scale to ensure meaningful relationships and minimize unintended consequences. Our experience with the health clinic has created trust and improved lives…even saved lives in the case of Latha’s baby. We constantly see lives changed through our work and this is at the root of the human experience of helping each other. The Women’s Cooperative Society that runs the flour collective is a recipient of the government’s assistance program providing discounted food rations, such as dried fish, rice, and sugar, to the poorest members of the village. Before Community Friends provided the flour grinding machine, the women in the collective had to grind the flour by hand. They make roti, hoppers, string hoppers and pittu and sell to little restaurants in the village. The restaurants open at around 6:30 a.m. selling. to fisherman and other workers setting out for the day. The women don’t make enough money from the collective to support their living expenses so they also work in the fields growing vegetables. This type of farming program is called Chaina Cultivation and has a long tradition in Sri Lanka. Government land is made available in the jungle at no cost. The jungle area is cleared by entrepreneurial villagers through field burning and then villagers grow vegetables which they sell at a farmer’s market in town. Everything is organic because they cannot afford chemical fertilizers or pesticides. The land is in rotation and after cultivation it is given a 6-month rest. One of the big problems with the farms in this area is the wild elephants which trample the gardens and cause mayhem. The villagers have built huts in trees where they take turns guarding the land 24 hours a day. If they see an elephant, the villagers light a “cracker” which is like a very large fire cracker or small explosive device. The loud sound scares the elephants. Latha’s mother, Abehami, is 75 and a widow. She helps with the chili grinding collective although she is blind and needs treatment for cataracts on both eyes. She opens up the room in her home where the equipment is housed and secures it in the evening, locking windows and covering up the chili grinding machine. She does not want to spend the money for cataract surgery because she feels that she will not live long. The medical care is actually free through the government’s socialized medical system. However, there would be some fees, transportation, food and housing costs of perhaps $250. She would have to travel to the capital city of Colombo or Kandy for the operation. This could be a 15 to 20 hour journey by bus and Abehami has never been far from her village. She seems content with her small contribution to the chili collective and she receives a small portion of the profits. After finishing with Latha, we brought the Rice Flour grinding machine to Mr. Piyasena’s house in Panama. In the early days right after the tsunami, Community Friends staff had stayed in the town of Panama, which is about 10 km south of Ulla, while doing relief work in the Ulla/Arugam Bay area. During our stays there, we often were put up by a friend of Geeva’s named Geetha. Upon arriving at Mr. Piyasena’s house, we learned that he was away, so while we waited we decided to visit Geetha and say hello. After exchanging news, we explained to Geetha what had happened with the collective in Ulla. That we had taken back the rice flour grinding machine and were looking for a new group who wanted to get into that business. Geetha was stunned. She said that she and a group of women in Panama had formed the Panama Women’s Cooperative Society. They worked together as a team and would find various businesses to get into. Currently, they had a baking business – making roti, pitu, string hoppers and this sort of thing. As a group, they had decided that their next step needed to be grinding their own flour, since their profits were being stifled by the high cost of ingredients. Being both familiar to us and well established running a business, we felt this was a perfect match for the equipment in our possession. So we entered into a deal with them on the spot, ran over to Mr. Piyasena’s house, collected the grinder and within an hour the whole thing was concluded. Good luck ladies! The war in the North and East of Sri Lanka made it difficult and very unsafe for Community Friends to visit the village of Ulla. Guerrilla attacks in the rural areas surrounding the town were happening regularly in 2008 and early 2009, catching farmers and other innocent victims in the brutal conflict between rebels and government forces. Kidnappings and political abductions also started cropping up in this region, with the most senseless of incidents occurring with the abduction of the head monk from a nearby Buddhist hermitage – who found himself in the hands of the Tamil Tigers deep inside the interior of Yala National Park. Fortunately, this incident ended well – the monk found an opportunity to escape captivity and somehow found his way home. But our inability to visit the community due to this danger created an obvious gap for us in our relationship with the two collectives. This problem was made worse by the fact that the school principal, Mr. Piyasena, who had been instrumental in overseeing the two collectives, was transferred to the school in Pottuvil. So for nearly a year we went without any reports from Ulla about the state of the two collectives. With the war ending in the summer of 2009, travel has once again become possible to the East. And so it was with this in mind that we came to Ulla in December of 2009. Coming here to Ulla again, it is obvious that the community is rebounding in most ways. Schools are open, restaurants and hotels are flourishing, roads and infrastructure has been rebuilt and everyone is generally back to work. You see small children everywhere. Now trees, scrubs and other vegetation have rebounded as well, giving the impression that the soil has managed to shake off the layer of salt that was deposited by the tidal floods. Still, the question remaining for us was, what has become of the two collectives that we had set in motion. Parents from the community had volunteered to act as mentors for each of these collectives. Each also had a designated spot where the grinding machines were to be housed. The expectation had been that the mentor would supervise the four or five teenage girls in the respective collectives, one with the mission of grinding rice into rice flour, the other with the purpose of creating chili power. The rice flour collective was supervised by a local fisherman named Shanta. His work shack, a small space standing next to the school, was our first visit. Regrettably, we found that the collective under Shanta’s supervision was not running. After much discussion, we concluded that this collective was not a good candidate for additional support from CommunityFriends, so we effectively terminated this venture. The chili power collective was supervised by a woman named Latha. She and the young women originally set up their work in a small house located in Ulla. After finishing with Shanta, we made our way to Latha’s house to see how things were going there. Like Shanta, Latha was very surprised to see us. After serving us tea, we explained what had been happening since our last visit. The house she had been using for the work had become unusable – she had difficulty accessing the property and the electricity was too sporadic. So, for mostly practical reasons, she relocated the business to nearby Panama. The five women feel that they now have a stable business and are looking to expand. They are now saving for a second grinding machine. Latha also wants them to go into rice flour grinding business. Good luck Latha and great job with your success so far! We received donations to assist our friends at the Cambodian language school who suffered from a flood in October. 2009 was a tough year. First the school was threatened because the landlord for the school property was about to sell it and force the school to close. Through generous donations, we were able to purchase the land and give it to the school so that the school could continue, hopefully forever. Then the flood came and closed the school for several days. Food was scarce during this time. Community Friends received additional donations to buy food and also bicycles for the children. The director of the school, Cha Cha, is an amazing man who founded the school to assist the poorest of the poor children in the area. He teaches them English and Japanese so that one day they can more easily find employment in the city through the tourist industry. Cha Cha supports the school out of his own pocket from working as a part-time tour guide. 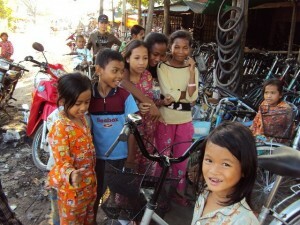 Cha Cha sent these photos after the children received the bicycles and food. We have been challenged by the drought for a year now. We lost most of the 9,000 new trees that we planted last year. Now the rains are starting again and we are beginning to plant once again. It takes so much labor to plant these nursery trees that we have grown as seedlings. We have to unload all 1,000 plants at the planting location by today before the rains start because with heavy rains the lorry will not able to make it all the way up the muddy mountain road. So far in the last few weeks we have planted 4,000 new trees. Our hope is that the trees will survive this time with enough rain water for irrigation. If we are successful, the trees will absorb tons of carbon dioxide during their lifetime and help with the world’s need for environmental restoration. We join hands with others worldwide to help the planet and its people. 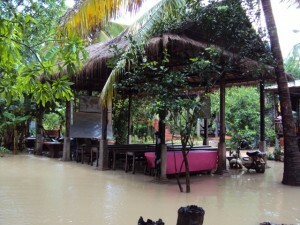 It has been difficult to travel to Siem Reap recently due to the flood caused by the typhoon on the 28th Sept from Vietnam. The typhoon went through Cambodia. 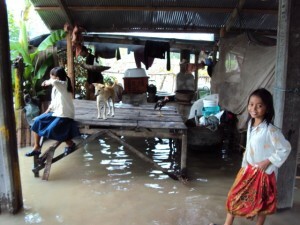 The whole country has been badly effected, especially the provinces bordering the Tonle Sap lake including Siem Reap. Up to now, the water level has gone down about 30cm. The rice crop now is submerged. People are worried that their crop might be ruined, and they will not have enough food to eat the following year. The school has been closed for 7 days now. I don’t know when I can begin teaching again because the village and the school are still under the water. In the photos, you can see some of my students who are in need for help. They hope that someone can help them overcome their obstacles.